This quote popped up on my weekly planner page for today, but it is one I have read before. This embodies what it’s like to have fibromyalgia for me. Having the courage to push through the pain on a daily basis, even when you feel like you have no strength left to do so. In the 16+ years since my diagnosis, I have had plenty of days where getting out of bed and walking across the floor were a challenge. When every step you take radiates pain through your body, and you wonder: Why am I doing this? Why don’t I just crawl back in bed? It would be so much easily to just curl up under the blankets with a heating pad than to try to work out, shower, and get ready to go to work. I am just one of those people who refuses to use my diagnosis as an excuse. Most of the time. I am not going to sit here and say I haven’t ever called in sick or missed an event, because I have. But for me, I don’t want fibromyalgia to define who I am, so I soldier on…through the pain. Courage can defined as “strength in the face of pain or grief” and also “mental or moral strength to persevere, and withstand danger, fear, or difficulty.” In that sense of the word, every person who deals with fibromyalgia or chronic pain is courageous in my book. We are Fibromyalgia Warriors. We may not look sick on the outside. We put on our happy face and go about our day. But on the inside, we are throbbing, sobbing, and often writhing in agony. Sometimes it is difficult for us to do even the simplest of tasks, such as buttoning a button or bending down to tie our shoes. I often get discouraged and certainly don’t feel courageous on days like that! I talk about Strength and Courage to give Hope to those suffering and bring Awareness to those who may have a loved one, friend, or co-worker silently suffering with chronic pain. 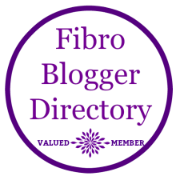 For more information about this debilitating condition, you can click the Fibro-Blogger Directory button farther down this page, on the right, or visit the National Fibromyalgia Awareness Org. Until you walk a day in our shoes, you really cannot understand the courage it takes at times to tolerate the pain we feel. Are you feeling courageous today? I can’t imagine the battle you fight on a daily basis, but it’s awesome to hear you’re facing it courageously. I wish you the best of luck! Also, I recently nominated you for the Blogger Recognition Award; I’ll leave the link to my post here if you want to check it out: https://jakejournal.wordpress.com/2017/02/04/blogger-recognition-award/. Keep pushing forward, and great work! I am both humbled and honored that you Find my little blog worthy. Thank you so much! !